This 1,410-square-foot apartment in the East Village, owned by sculptor Yvonne Hananel, is the work of the Manhattan-based firm James Wagman Architects. Their client needed a reconfiguration of the interior to improve its “circulation” and increase the livable square footage for studio space. 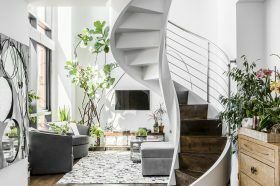 The entire pad got upgraded, then the architect added a custom-designed, open helix staircase not only as the focal point but as a way to open up more floor space. As for the design, Hananel kept it minimalist. “By keeping the walls white and uncluttered, everything from the green leaves of my ficus trees to the colorful books on the shelves stand out in high relief,” she told Houzz.